View More In Omega Oils. There are many causes of stress in an aquarium environment. Most often this takes place when you first introduce a new fish into your tank. The usual result is a lack of appetite, which can be deadly. Lack of on-going, consistent nourishment can quickly lead to disease or other health problems. First Flake has been carefully formulated to satisfy all of the needs of both fresh and saltwater tropical fish and offers the added benefit of super charged attractibility. This comes in the form of fresh marine fat, and lots of it. 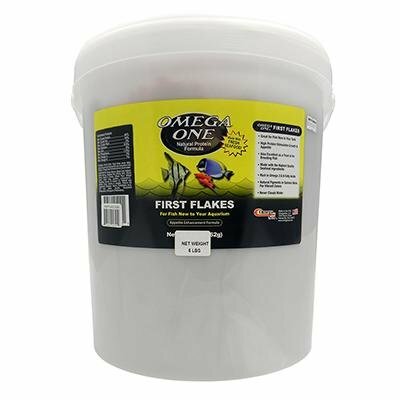 First Flake should always the very FIRST food you feed a fish that is new to your aquarium or a fish that is stressed in any way. It is also excellent as a growth food as well as an once-a-day treat food. Excellent for newly introduced fish Supplement for breeding pairs to enhance productivity Bursting with Omega 3 & 6 Fatty Acids Salmon skin enhances color, naturally High protein, low starch Doesn't cloud water Ash levels are 8% or less Ingredients: Whole Salmon, Black Cod, Halibut, Whole Herring, Whole Shrimp, Wheat Flour, Wheat Gluten, Fresh Kelp, Lecithin, Astaxanthin, L-Ascorbyl-2-Phosphate (Source of Vitamin C), Natural and Artificial Colors, Vitamin A Acetate, Vitamin D3 Supplement, Vitamin E Supplement, Vitamin B12 Supplement, Riboflavin, Niacin, Pantothenic Acid, Folic Acid, Biotin, Inositol, Tocopherol (Preservative), Ethoxyquin (Preservative). Guaranteed Analysis Crude Protein44.00% Min. Crude Fat14.00% Min. Crude Fiber2.00% Max. Moisture8.50% Max. Ash8% Max. Phosphorus(0.5%) Min. Omega 32% Min. Omega 61% Min. Helps treat lack of appetite in new fish recently introduced to an established aquarium-both freshwater and saltwater tropical fish. First Flake should always the very FIRST food you feed a fish that is new to your aquarium or a fish that is stressed in any way. It is also excellent as a growth food as well as an once-a-day treat food. Supplement for breeding pairs to enhance productivity. Price is for one 5 lb. bucket. If you have any questions about this product by Omega One, contact us by completing and submitting the form below. If you are looking for a specif part number, please include it with your message.